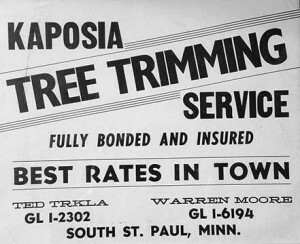 I’m Terry Trkla, owner of Kaposia Tree Service. My company was first established by my father in 1962 and now operated by me and a crew with over 47 years of experience. We take pride in the work we perform and understand the value of the trees and shrubs on your property and how important it is to respect your home and surroundings during our work. Our cleanup after the job is always exceptional. We have all the proper equipment to handle all your tree care needs. 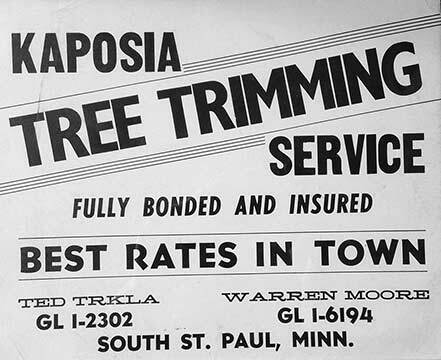 As the owner of Kaposia Tree Service you have my personal guarantee of total satisfaction. Our slogan since 1962 has been “Best Rates in Town” and still is today.